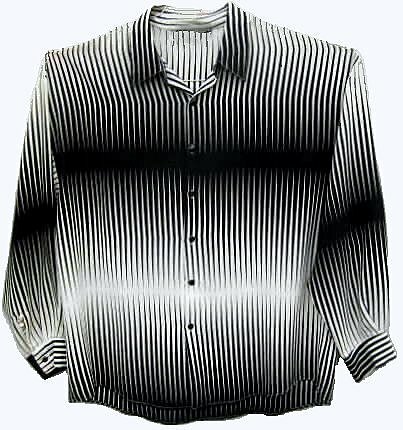 This shirt has a cool pattern that may be a bit hard to make out. It's as if black diamond shapes have been stretched out to exaggerated points against an off white background. Sold The optically unqique shirt is made out of a lightweight polyester crepe. It is machine washable inside out on gentle as it's a real shirt, not costume. It is approximately 51" around at armpit level for a 48 fit. The shoulders are 26.5" for a 2-3x today's fit or an oversized 80s type fit. Machine or hand wash inside out on gentle. Dry flat or hang.